Pam Boyd poses an important question for you to consider. 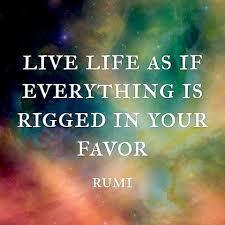 What if the world is rigged IN your favor? This is almost comical for those of us who have had difficult lives. As some of you, I spent lots of time complaining about life being rigged against me or in someone else’s favor. It sure seemed as if it were! But, now I believe I was totally wrong. In short, the most significant revelation of my life has been that life has always been rigged in my favor.